With so many coughs and sniffles flying around, I wondered to myself how I could contribute to the health of the nation (or at least those who travel on the central line and run the risk of infecting me!). 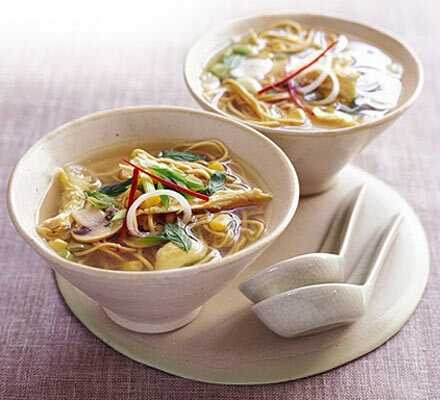 Chicken soup is renowned (yet not scientifically proven) for its restorative properties when feeling a little under the weather with colds and congestion and this is one of my favourite recipes. Pour the stock into a pan and add the chicken, ginger and garlic. Bring to the boil, then reduce the heat, partly cover and simmer for 20 mins, until the chicken is tender. Remove the chicken and shred into bite-size pieces using a couple of forks. I personally don’t like mushrooms so always leave them out; they can be replaced with any other vegetable that I fancy. You can also add a few more noodles to make it more filling. This is comfort food at its best; low calories and satisfying!